What do you get when you mix enthusiastic people, creative thinking and a culture of trust? You get TeamSnap! Outside Magazine has named TeamSnap No. 6 on its 100 Best Places to Work 2016 list. Each year, Outside honors the Top 100 companies in America that raise the standards for work-life balance, company culture and employee benefits. This is the second consecutive year TeamSnap has made the list and represents a 10-point jump over last year. I sat down with TeamSnap’s fearless leader, Dave DuPont, to get his take on what makes TeamSnap’s culture award-worthy. Find out more about working at TeamSnap and what positions we have open! 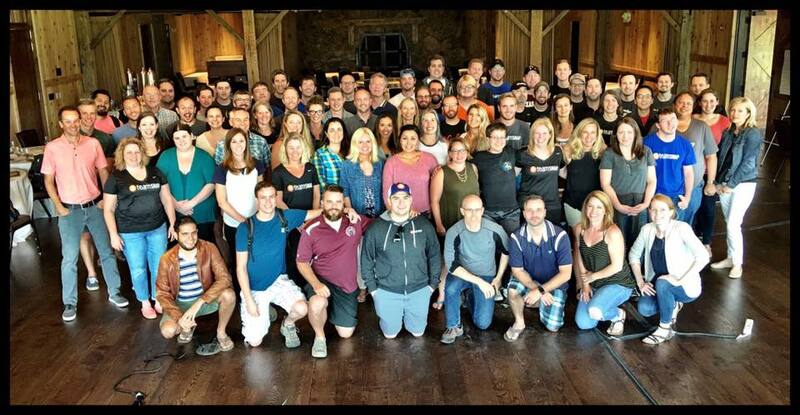 The whole crew, together in the mountains of Colorado at our twice-a-year all-company meeting. This is the second time we’ve been appointed to Outside Magazine’s 100 Best Places to Work list. What does that achievement mean to you? It’s recognition that we’ve been able to build a unique and very positive culture that’s appreciated internally and externally. How would you describe TeamSnap’s culture? In a recent all-company meeting, one of our team members brought up the thought that everything here is based on trust, and that really stuck with me. Out of trust comes respect and autonomy and not sweating the details, which are all tenets of our culture. We trust that when we tell people the high-level goals of what we’re trying to accomplish, they’ll figure out how to get it done. How does that level of trust trickle down through the company? My style is to say that we’re running this business together, and that implies trust. I share information to an unusual degree because I’m looking for people to not just manage their particular functions but to help me manage the business. Everyone has different skills and strengths in certain areas, but we’re all trying to run the business and don’t just stick to our own lanes. If you look at a lot of established organizations, people just fight for their function. I’m providing info to people and treating them in a way understanding that they’re not just going to support their own interests, that they’ll think about the whole company’s interest. When you and Andrew founded TeamSnap, was culture something you actively thought about trying to nurture? How has the culture developed over time? Well, we weren’t necessarily thinking about culture with a Capital C. We weren’t going at it trying to get on lists. I’ve been in a variety of companies and seen the good and the bad, so I did have ideas about the kinds of people I was looking for with TeamSnap. It was really a combination of a desire of wanting to work with great people, have a great experience and build a great company. I do think there’s also a bit of alchemy here. I certainly have a lot of good practices and can point to things I influenced, but our successful culture also has to do with this kooky guy who went to an experimental high school in Alaska. We wouldn’t be who we are without TeamSnap Co-Founder and Chief Creative Officer Andrew Berkowitz. He’s a think-outside-the-box kind of guy all of the time. It’s caused us to be more questioning of established orthodoxies, like remote work, for example. How important is cultural fit when interviewing employee prospects? It is all important. We involve lots of people in the interview process and articulate what we’re looking for in terms of good employees. We also have people who represent the “soul” of the company who help on interview processes, to see who will fit. One of the dangers of having a strong culture that you make sure people fit into it is that you can overlook diversity. If you have a strong idea of what you’re looking for, you could tend to seek out people who have similar characteristics. Although not everyone here is the same, it is a danger we’re aware of. We started off with people from very different backgrounds, so it is something we are aware of, and remote recruiting also helps open the pool of prospects. What advice do you have for other startups when it comes to culture? Be deliberate about what you want to do. Don’t start off by thinking “I want to build this kind of culture.” First, understand what you want to do as a company and what your vision is. Then, think through what that means about what you need to establish around culture to fulfill that vision. The type of culture we have might not work in a different industry or a company with different goals. Certain businesses require a level of operational focus, and we’re much more focused on creativity and product excellence, and our culture supports that. Ultimately, the culture you build should reflect you and your people and what you’re trying to achieve. Create your own culture, don’t imitate a fad.